“Between Dawn and the Birth of a Song” has been published by Pig Mountain Publishing House, Toronto, Canada, and will also feature soon on the High Peaks Pure Earth Winter List. ‘I was sipping on a drink in Goa / Away from all the silliness, / Wading in the warm ocean; / I was minding my own business …’ writes Gashi Tenpa Dhargyal in a sharply funny and fanatically satiric poem titled The young king and the sea. This is emblematic of Tenpa’s writing and things that must boil in his heart and mind. Tenpa’s family has a rather illustrious history. His great-grandfather served as the manager for Gashi Doring, one of the foremost aristocratic families in Lhasa, Tibet’s capital city. The Doring family, which is the name of their mansion in the capital, has produced some of the great personalities in Tibetan history, including Gonpo Ngodup Rabten respectfully called Doring Pandita for his administrative, scholastic and religious achievements, and Doring Tenzin Paljor, a minister or Kalon, who played a prominent role in negotiations with the Gurkhas in the Tibeto-Gurkha War (1788-1791). In the early nineteenth century, the Doring family permanently moved to Gyantse, a town in central Tibet, and discarded the famous Doring tag and instead called themselves Gyantse Gashi or the Four Loves of Gyantse. Later on, when a part of Tenpa’s great-grandfather’s family moved to Phari, a border town in southern Tibet, the new house was called Phari Gashi or the Four Loves of Phari. 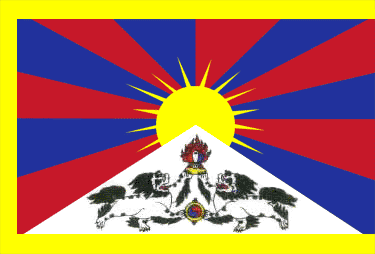 Tenpa’s father, Tsering Dorjee, was one of the fourteen children that his parents gave birth to. In the aftermath of China’s occupation, Dorjee took a chance to go to Beijing to study at the Peking Institute of National Minorities in 1956. A decade later, he was horror-struck with the socialism and damage it wrought upon his country and the people. Consequently, in September 1966 a few months after the Cultural Revolution was unleashed in Tibet, Dorjee escaped into exile. Today’s poet was born in Mundgod Tibetan settlement in South India and later moved to Delhi where his father worked at the Tibet Information Monitoring Centre. He was sent to the Tibetan Children’s Village school in Dharamsala, a small town in northern India. In school he acquired this foreign language, where students were made to memorize phrases like ‘as tall as elephant’, ‘as tall as hill’, ‘fall from grace’, ‘the apple of his eyes’, ‘a chip on your shoulder’, ‘a labour of love’ etc. Many of these phrases obviously originated from the Bible and hence didn’t mean anything to Tibetan children. Nevertheless, Tenpa has gained a great command of this acquired language and makes words march forward or sentences flow like sands in an hourglass. When I was in school, I heard a legend about Tenpa. There was a famous English teacher who I used to think was a retired colonel from a Gorkha regiment. His short black hair was disciplined so well that not a single hair strayed and his Stalinesque-moustache was likewise regimented. This teacher once reportedly remarked that in all his teaching life, he came across only one student whose command over English was good enough to be passed as a native speaker. The student obviously was Gashi Tenpa Dhargyal or Temdar as he used to be known in school. Tenpa does not disappoint us. However, like many other writers writing in a language acquired through circumstances forced upon themselves, Tenpa, every now and then, falls back into a habit of using, as Orwell says, ‘worn-out phrases’ and ‘dying metaphors’ that should have been in the trash bin with its lid sealed. 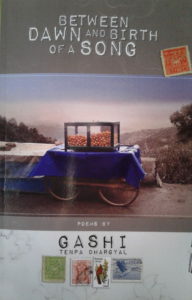 Nevertheless, Between Dawn and Birth of a Song is a precious book containing 72 poems spanning over three decades. In a dream, he sees a Chinese soldier dead, and a voice in the dark night bellows ‘Such traitors die swift!’ When he turns the dead body over, aghast, he sees his own ‘very living face’ staring back at him. The essence of all art is to display the nature of all things in all their beauty and starkness. Tenpa does it well. “Four loves of Phari”, his father’s memoir has been translated into English. Ask him for details if interested.